Buying New York Yankees tickets is pretty easy. 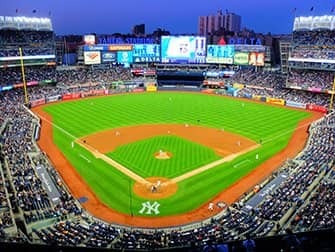 Did you know the New York Yankees often play six times a week? That gives you plenty of options to go see them play. Are you not much of a sports fan, or maybe just not this sport? No problem, the atmosphere alone will be worth a trip to the stadium. Especially since tickets needn’t cost a lot, and you can leave the stadium at any point. If they aren’t playing a home game, consider checking the New York Mets. The baseball season runs from April to October. 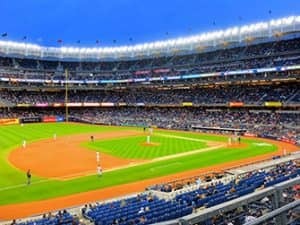 Buy New York Yankees tickets now and pay no service fee and get free local pick-up! First choose the date you’d like to visit a baseball game or view the table below. The tickets can be paid by credit card. You can only purchase mobile tickets (for your smartphone) or paper tickets to a New York Yankees game. The mobile tickets can’t and don’t need to be printed out. NewYork.com.au is the only website that offers free local pick up of your (paper) tickets. This is possible from Monday to Saturday at the office located on Times Square. See here for the address and opening hours. If your Yankees game is on a Sunday, then you can pick up your tickets on Saturday at the latest. The tickets on the site are from season ticket holders who cannot make it, this is why they are available at discounted prices. 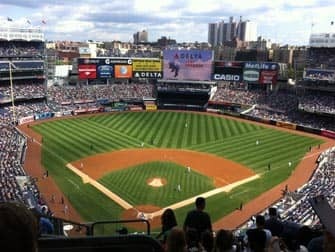 Sometimes the tickets are more expensive than the original price, this means that the New York Yankees match is sold out. 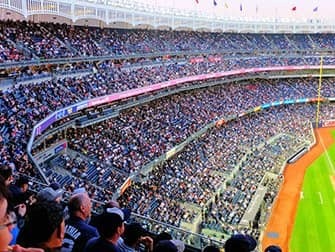 Where Should I sit at a Yankees Game? Tickets for the New York Yankees can cost anything between $10 and a few thousands dollars. A reasonable price for a good seat costs somewhere in the region of $35 and $105 a ticket. The Yankee Stadium is huge. To have a good view, I recommend choosing seats within the areas that I have marked in red on the plan below. If you are going to a game primarily for the atmosphere, then tickets in the 400- series (above the area marked in red below) are also fine. I do recommend choosing a row number as low as possible. The only seats that I don’t recommend are at the the back of the playing field. From here, you only get a partial view of the game. The easiest way to reach the Yankee Stadium is by subway. The stop is called 161st Street and the stadium is right across the station. Subway line 4 brings you directly to the Yankee Stadium. Line B and D go in the same direction, but they don’t always stop at 161st Street station. If you’re getting onto one of these lines, make sure to ask a New Yorker (preferably one with a Yankees shirt) whether the subway stops at the stadium or not. All of these lines basically cross all of Manhattan, so you can hop on at many different stops. When Should I Arrive at the Stadium? I would aim to arrive 30 to 60 minutes before the first pitch. Ideally, make sure to be seated at least 5 to 10 minutes before the game starts, so you won’t miss the national anthem, which is quite an event in itself. Although halfway in the 7th inning there will be singing again. If you arrive early, go have a look at Monument Park in centre field, below the video board. Here you can see a memorial for former Yankees members, and, even better, you have a great up close view of the field. 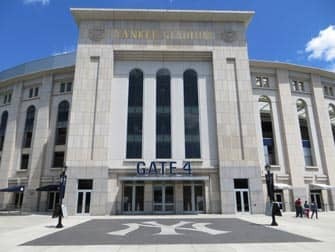 Entrance to Monument Park is free and it remains accessible until 45 minutes prior to the scheduled start time of the game. Subway will be the best option to get back to Manhattan after the game. Leave a little early if you are worried about the crowds. Eric’s Tip: Going to a live baseball game in New York is an activity I would recommend for everyone. It’s also a great thing to do for families with children. Don’t feel obliged to stay throughout the entire game. Personally, I usually leave around the eighth inning.